SOAK YOUR NUTS PLEASE! ? Nuts are a great nutritional addition to your diet but just like grains their outer skin also contains enzyme inhibitors and phytic acid (called broadly anti-nutrients) which protects them and prevents them from sprouting but also means it prevents the full digestion of the protein in them and bind to minerals like calcium, iron and magnesium and prevent them from being absorbed. Therefore, although you might eat high amounts of nuts the protein will not be properly digested and the minerals will not be absorbed. The way around this is to soak your nuts and seeds overnight with ½ tsp of salt. This will neutralize some of the anti-nutrients. Put all nuts, dates and cocoa nibs in a blender with an S blade and blitz until it forms a paste that holds its shape when pressed. This should take around 2-3 min. Ultimately, you can do it as smooth or rough as you want. Wet your hands and start taking some mixture into your hands (roughly a tablespoon) a shape it into a ball. Do so until all the mixture is finished. 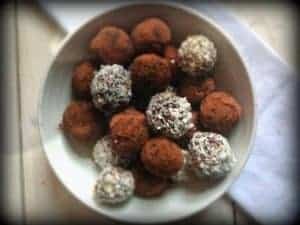 Run your balls alternatively though cocoa powder or grated coconut. Enjoy and let me know what you think! The energy protein balls are a perfect nutritious, fast and affordable snack!